Jessica brings a youthful but highly experienced approach to styles. She is excellent with cuts, color, Brazilian blowouts and styles. If you are looking for a special occasion hairdo, Jessica is the one for you! Susie is a master stylist who offers perms, haircutting, Brazilian blow outs, color, styles and roller sets. Susie's experience and talents will make you feel brand new! Be sure and ask about them! If you are looking for a special occasion up style or braid, Maria is the stylist to see! She is a master of cuts, colors, perms, roller sets and Brazilian blowouts. Maria loves transforming a client from an everyday look to one for a special event. Whether it is for a wedding, coming of age ceremony or a birthday party; you’ll look fantastic! Having received her training in Boston and San Francisco, Chris has decided to return to her hometown. Chris’s expertise includes hair extensions, colors, cuts, perms, up styles and on trend styles. Christie is offering first time clients 30% off all her services. Come in and experience her talent for yourself. Colleen Homan adds triple talents to Pizazz. Not only is she a talented hairstylist, she is also a licensed aesthetician and HHP massage therapist. She has 1000 hours of massage training in the various modalities. Colleen can do it all! Aida’s professional approach is to individualize your color, cut, perm or style. She personalizes each service specifically for your face and hair type, so it is perfect for you. Your transformation will amaze you! Aida is also a part time stylist, so you'll want to make an appointment. Laura has years of expertise in color, cuts, styles and Brazilian blowouts. Her cheerful smile will make you feel welcome. Laura will take time to get to know you and your lifestyle to make you look your best. She’ll design a hairdo that you can easily recreate at home. Valerie brings a vitality to haircuts, color and styling techniques. She is enthusiastic about providing the best salon experience that she can for her clients. Valerie works part time so an appointment with her is recommended. Sherry has many years of experience in hairstyling, and she personalizes her cuts, colors, perms and roller sets to make sure that her customers not only look good but also feel good about their experience. 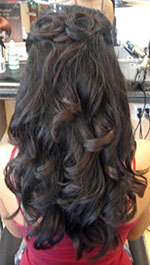 Wafa's unique approach to hair styling makes her a natural with a mature client and customers of all ages. She is great with color, perms and cuts. Her kind and gentle nature shows through her work and she takes great care of her clients to make sure each person is completely satisfied. Bonnie's clientele often consists of an entire family. She's great with all ages from toddlers to seniors. A complete variety of hair services such as color, cuts, on trend styles is her specialty. Rochelle is an expert with curly hair; she's had it all her life! Her experience with color and corrective color can fix any “problem/botched” hair. Rochelle’s talents also include cuts, highlights, Brazilian blowouts, perms, styles and roller sets. She has a flair for the dramatic if you are so inclined. Lisa is a Master Stylist who shows her talents by tailoring her work to enhance your facial features making you look your best. Her specialty is color and stays current with hair trends. So if you want balayage, ombré, sombré,, babylights, highlights, smoothing treatments, color and haircuts, trendy or classic, Lisa is your hairstylist. Services are offered to women, men and children. Lisa is offering first time clients $45.00 off a Brazilian Blowout through November. 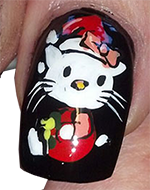 An award-winning nail artist who is renowned for her exceptional designs, Nancy has many years in the beauty business and offers a range of services including acrylics, gels, nail wraps, manicures and pedicures. Cathy is a master at pink and white (French) acrylic nails. Her skills include gels, manicures and pedicures. She can decorate your toes with distinctive designs! Artemis embraces doing natural nail services. Her manicures and pedicures are sure to pamper your hard-working fingers and toes! She has also perfected backscratcher nail extensions. Nancy's formal art training has been an asset in helping create the perfect look for your wedding, special occasion or designing your new look. 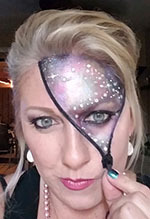 Halloween makeup is one of her specialties. Esther has joined Pizazz bringing her talents in Eyelash Extensions to our menu of services. She is also highly skilled in all forms of waxing and will make you feel comfortable and relaxed as she performs your service. Marianna's previous experience as an aesthetician with Adrien Arpel and Neiman Marcus speaks for itself. You can feel confident and in good hands with Marianna. Her experience and thorough knowledge of skin and body care provides her clients with treatments designed especially for their individual needs. The custom facials she creates will have your skin glowing! In addition, Marianna also offers a variety of waxing services. Avon books available at Pizazz Hair & Nail Salon Featuring Mira Day Spa. If you're interested in working with our staff please contact Nancy at (619) 582-7459 for current opportunities. We look forward to speaking with you.